The Patriots really do rule New England, and the Cowboys might just be America's team. But after that, things get complicated. On Thursday, the Seattle Seahawks crushed the Green Bay Packers in the first regular NFL game of the season. One way of looking at that: The 46 players wearing Seattle Seahawks uniforms had a higher score than the 46 players in Green Bay Packers uniforms, in a nationally televised game of American football. Another? The residents of Seahawks terrain—which stretches from the northernmost Alaskan tundra to the potato fields of central Idaho—won some spiritual victory against the cheeseheads of Packers territory, which consumes all of Wisconsin and some of Michigan’s upper peninsula. We can be so precise about these geographies of fandom because the Facebook Data Science team just released its 2014 NFL American fandom map. The map shows every American county’s favorite professional football team, as judged by the NFL team that Facebook users in that county have ‘liked’ the most. Now we can examine the football version. Here’s a larger version of the map if you want to check out your home county, but there are also some regions and phenomena that stuck out. First of all, unlike the MLB map, there’s no clear “national” team. In the baseball map, Yankees fans functioned like cosmic background radiation. Love for the the Bronx Bombers bubbled up in the absence of some local franchise, appearing not only in greater New York City but also in North Carolina, Nebraska, Nevada and New Mexico. That’s just not a feature of the NFL map. The Cowboys come closest, but they’re not “America’s team” as unambiguously. Beyond Texas and its neighbors, the only isolated pockets of Cowboys fandom are in southern Nevada and southeastern Virginia. That’s it. After the Cowboys, the Broncos control a huge region. Pluralities of Broncos fans can be found all the way from three of the Four Corners to the 49th northern parallel. Rivaling the Broncs in terms of sheer regional hegemony are the 49ers, which rule almost all of California; and the Patriots, whose fans run from Hartford, Connecticut to Caribou, Maine. And hopefully fans of all of those teams can work up some pity for the New York Jets, whose supporters rule… well, nowhere. 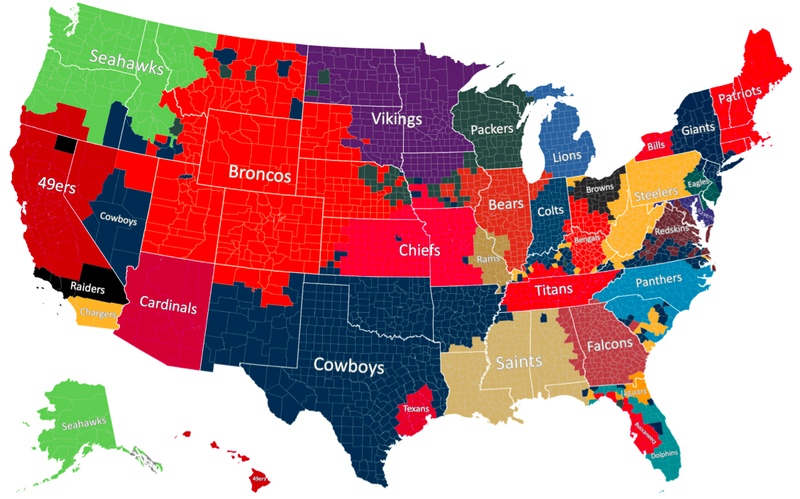 No U.S. county has a plurality of Jets fans, at least on Facebook. Most interesting to me, though, is the Great Lakes region, where old clubs compete for dominance. The borders here become stark and stubborn. The Lions would control all of Michigan—except for those pesky Packs in the southern Upper Peninsula. The Colts could claim Indiana—if not for greater Gary. And Packers green hovers at the edge of Vikings country, as if waiting to move in. Another place to check out: Los Angeles, whose residents apparently still cling to the Raiders—a franchise which abandoned the city 20 years ago. Facebook is one of many tech companies that periodically releases free analyses of data. In February, for instance, it revealed what it sees when two users fall in love. Data like this is always fun, and helps us get at questions that are otherwise unanswerable—but it’s also a chance to think about everything that giant social networks like Facebook can see, things that are deeper or more important than which team a certain county roots for.